Lake Ronkonkoma is Long Island’s largest freshwater lake and a popular summer destination. According to legend, it is also cursed. Men beware––this body of water is said to be the home of a vengeful spirit that claims one male life per year. unable to deal with this arrangement and snapped. She sent a final farewell note to her lover. He received it on the shore and minutes later, the canoe washed up in front of him as well. Inside it was the princess’s body––she had committed suicide in the middle of the lake. He too committed suicide out of anguish over the death of his one true love. Since that day Ronkonkoma has haunted the lake, becoming known to many as the Lady of the Lake. Angered because she wasn’t allowed to love in life, she now drags one man into the lake each year. People say that at least one person has drowned each year in Lake Ronkonkoma for the past 200 years, the large majority of them male. Many others have reported being drawn by some unseen force out to the center of the lake, as if something was trying to drag them in. These souls have been able to resist the pull of the Lady of the Lake, and have been lucky enough to live to report the existence of this strange phenomenon. Another myth of Lake Ronkonkoma purports that the lake is bottomless and that its depths are dotted with many caverns and subterranean passageways. Many of the bodies lost to Ronkonkoma never surface on the lake’s shores, but are sucked into these underground tunnels and later turn up in the Long Island Sound, on the shores of the East River, and even as far away as Connecticut. In some cases, bodies have disappeared for as long as three months before washing ashore miles away from where the unfortunate victim first vanished. Lake Ronkonkoma is a site of anguish, lost love, and vengeance. Be mindful while walking its shores––the Lady of the Lake is forever looking for a new lover to keep her company. You can read more about the all the Local Legends of New York in Weird New York. The Stories on this site are just the tip of the iceberg. 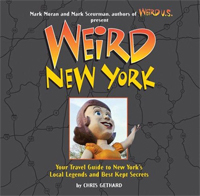 Buy Weird New York today!